Thermostat in Golden, CO | Quinnair Heating & Air Conditioning Inc.
Quinnair has strategically been in the area of Golden, CO since 2005 offering our thermostat repair and installation services. 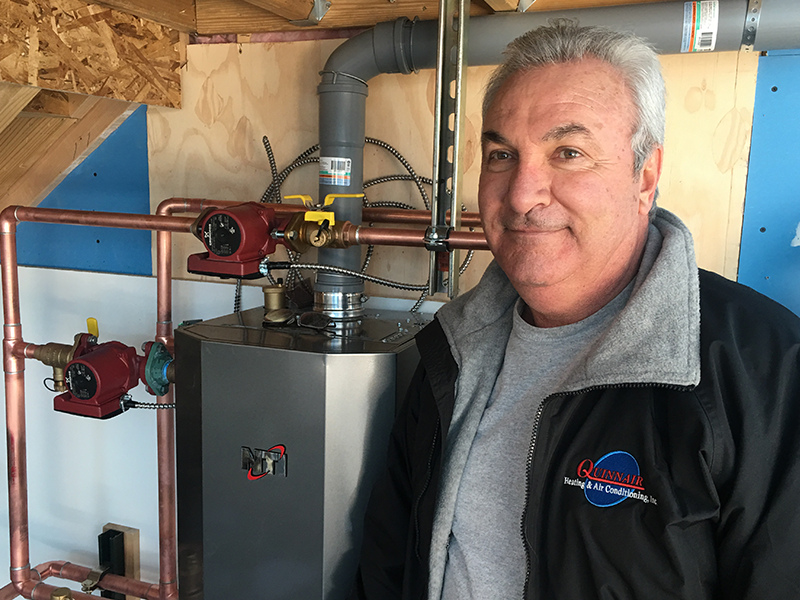 We know that there are times when it is necessary to turn on the heater to keep our families comfortable and safe during those cold winters, and there is nothing as upsetting as to find out at the last minute that something has gone wrong. No heat is coming out of the vents, or the thermostat doesn't work. The same situation can happen for air conditioners malfunctioning during summertime. Quinnair offers a variety of services covering the different types of needs a household may have. Our experienced technicians know how to fix every problem you may be having with your thermostat whether it is summer or winter. For the client that seeks a well-done job and a great deal; we offer free estimates and evaluations of the problem. Allow Quinair to be your to go HVAC repair company that can guarantee and assess any job. Call us today for more information, or you can visit our website for more details on how you can obtain a free quote from us. Don't run the risk of sleeping through a cold night. Call today! There was a time when we all knew that the job of a thermostat was to turn on the heater and regulate the indoor temperature. Well, those days are gone. Thermostats have changed, and with that change, they have brought the ability to control more than heat. One can control lighting, temperature, thermostat for all homes you may own and all their rooms. You can choose to have a different setting in each room, even the garage. It's incredible what we can do with our smartphones nowadays. You may be asking, do I need all of that? We'd say, no, you don't. This kind of technology may apply to folks that are interested in monitoring their state of the art homes from afar, but we know it isn't for everyone. Take a look at our website to understand more on the subject. We are experienced technicians and can help you in your search for your next new HVAC system. We are in Golden, CO so feel free to visit us during business hours. Give us a call or email us or visit our website to schedule your subsequent evaluation. Call us today! Heating, Ventilation and Air Conditioning systems control the temperature in homes to bring comfort to those in it. HVAC systems have changed through the years, but they are mostly the same. Their job is to circulate air in the house or building at a temperature of one's choosing. Depending on the climate of where you live, it is vital to have airflow that allows for moisture to dry out thus preventing mold build up on the walls and furniture. One other function is to warm up the house during a cold night or to circulate cold air. One older type of system called a Swamp Cooler is a handy way to cool down a structure which can save you some money. thermostat is a perfect way to control your indoor's space for your comfort. Quinnair can service either of these systems, replace them entirely with a new one. We have been in Golden, CO since 2005. Visit our website to schedule an appointment or request a free quote. Today is the day to consider our service. Call now! Our expert staff is on standby eager to help you or walk you through your HVAC problems. Our expertise gives us the confidence to bring functionality back into place for your thermostat, whether for replacement or straightforward repairs. Quinnair has been in the area of Golden, CO for over 12 years offering a great deal to its surrounding communities. We provide state of the art systems, conventional swamp coolers, and heaters. We specialize in residential and light commercial installations and repairs. We know that quality is necessary when it comes to HVAC products and repairs, so we deal with the best distributors in the industry to ensure your satisfaction. We are the best, and like the best, we offer free estimates and evaluations. Call us today, don't hesitate. Visit our website for more information and contact us for a free quote. Keep the quality of your indoor air flow at its best. Call us today!